The LH 110 C High Rise Port showcased at Bauma 2016 is designed for quick and efficient handling of bulk and general cargo in ports. Its configuration includes an angled 13.0 m / 42’8’’ boom and a straight 12.0 m / 39’4’’ stick. 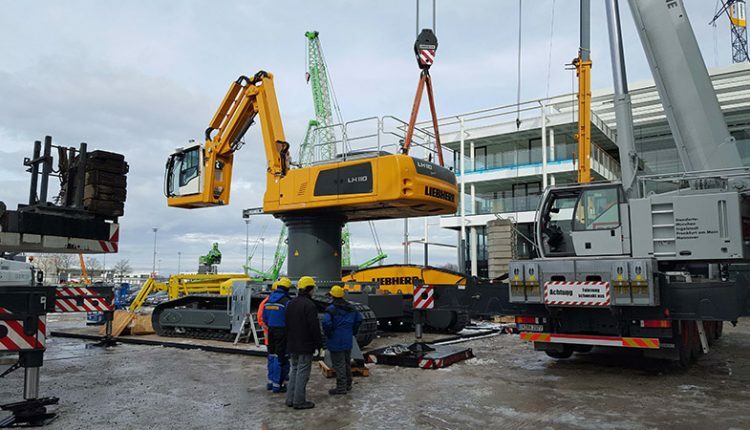 The stick with hydraulic quick-coupler in combination with the Liebherr multi-coupling system for hydraulic lines gives the machine the necessary flexibility for diverse port applications. The configuration also includes a Liebherr grapple model GMZ120 for bulk material with a capacity of 8.0 m³ / 10.46 yd3. Other highlights of the exhibit are the hydraulic double-pivot cab with infinitely adjustable height and forward movement, sliding doors with ground accessIn addition, the LH 110 C High Rise Port features a robust crawler undercarriage with extra tower height of 2.0 m / 6’7’’ The patented energy recovery system (ERC system) comes standard on the LH 110 C High-Rise Port. The Liebherr LH 110 C High-Rise Port is powered by a 6-cylinder Liebherr diesel in-line engine designed to meet Stage IV / Tier 4f emission standards. The machine is also available in Stage IIIA for certain countries. The LH 110 Port has an engine power of 300 kW / 408 HP and, thanks to the ERC system, is able to deliver an overall system power of 431 kW / 586 HP. With the newly designed configuration, the LH 110 C High-Rise Port achieves load capacities up to 10 t / 22,046 lb with a range of over 20 m / 65’7’’. The working radius of the machine is up to 27 m / 88’7’’. The cab of the new LH 110 C High-Rise Port material handler offers optimal operator conditions for productive and focused work. Operator comfort is enhanced by the ergonomic design featured on the control consoles and operator’s seat, along with the excellent panoramic view and low noise levels.